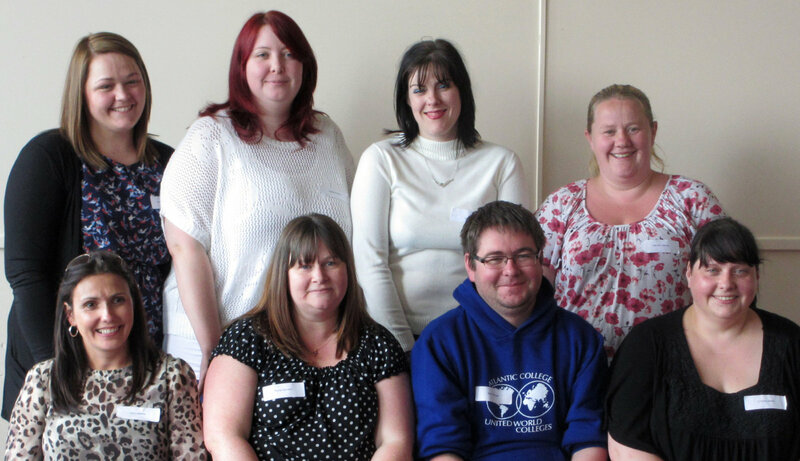 The James Watt Kilwinning 'Access to Nursing' class of 2012-13 are looking forward to progressing towards a qualification in the nursing profession. Many will be moving to university next year, but others will remain at college to first complete an HNC. "My name is Lindsey. I'm a single mother of four children. I have worked in various customer service roles, from complaints desk to tax assistant. I really wanted to be a nurse but lacked the qualifications, having left school at my first opportunity. Now I'm heading to university at the ripe age of 40, along with my two daughters. It's an exciting prospect!" "I'm Mark. I'm 26 years old. After leaving school, I went to work in a local supermarket. I always wanted to be a nurse, but never had the grades for uni. I thought this course was good because all of the students are mature and we have the same goals. I'm now going on to UWS to study for my nursing degree." "Hi, I'm Mandy. I'm a 27-year-old mother of two. I returned to education to gain a good career and provide for my children." "Hello, I'm Leeann. I'm 33 years old and live with my husband and two kids. After leaving school, I went on to work in the care environment. I have returned to education as I feel I am at a stage in my life when I'm ready to progress." "My name is Janine and I'm 26 years old. I decided to take on a new career challenge. I previously worked in sales and hospitality. I decided it was time to follow my passion for caring for people." What has been the best part about your SWAP programme and your year at college? "It was great to get back to learning and using parts of my brain that I didn't know still worked. I met a great new group of friends and a study group with same interests as myself. The mixture of subjects really opened my eyes for the next step in my learning journey." "I enjoyed it a lot. I felt it was aimed at the older student and the course and the information was exactly what I needed to progress." "My experience on the Access to Nursing was one of the best experiences I've ever had. I've made good friends that I will keep in touch with. I've achieved passes that I never thought I could have done." "I have nothing but praise for the programme. The lcasses have been well structured and delivered. The whole experience has been full of positives. I was apprehensive about my abilities to cope with the course content and the standards required, due to being absent from an educational setting for a significant period, but all my lecturers have been wonderful, assisting with all my queries." "If anyone had told me how much my life would change in one year, I wouldn't have believed them. I am so glad I had the confidence to take the first step."